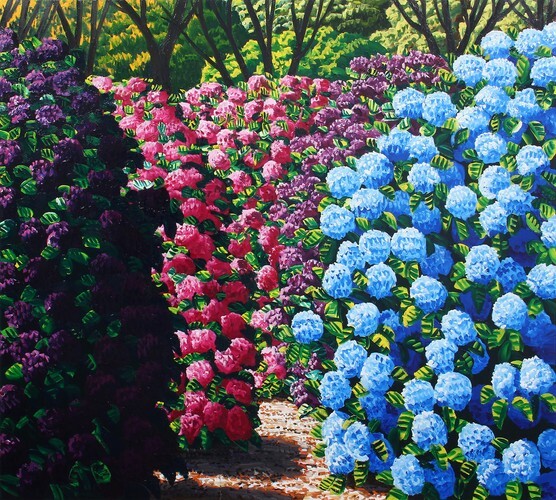 Karl Maughan's new series of paintings continue his exploration of garden scapes. 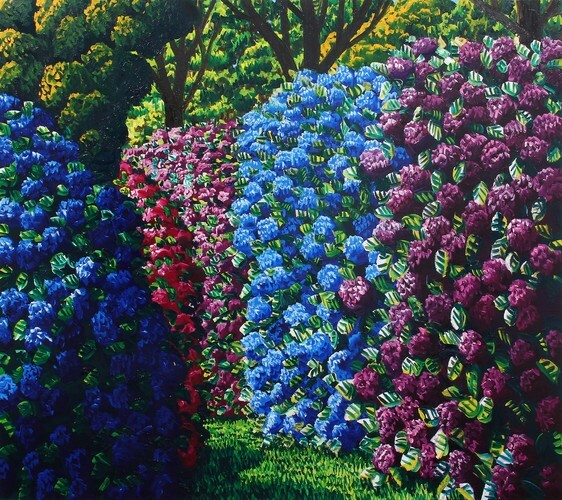 In a lateral shift from the rhododendrons for which he is best known, Into the Woods is full of rounded hydrangea forms in electric shades of blue and purple. Under the lush texture and colour, however, dissonant chords play through the painter's imagined Arcadia. 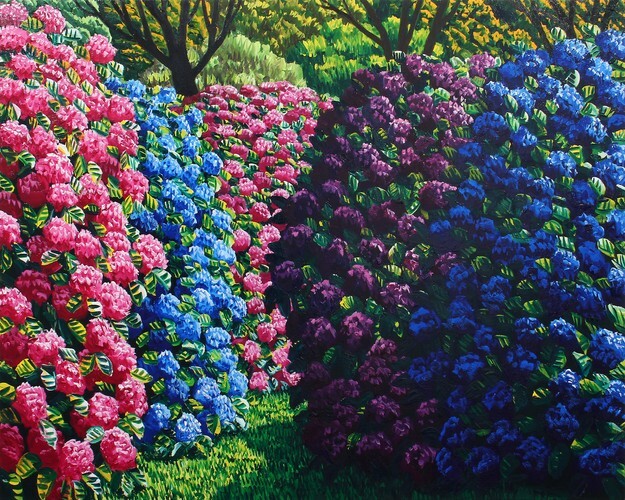 Maughan paints possibilities: his gardens do not reproduce a particular area or time but depict vistas replete with potential. As the viewer contemplates a canvas, their response is coloured by their own sensory memories and personal experiences. The visual framework provided by the artist, however, is carefully structured to guide the viewer along pathways that may unsettle as well delight them. 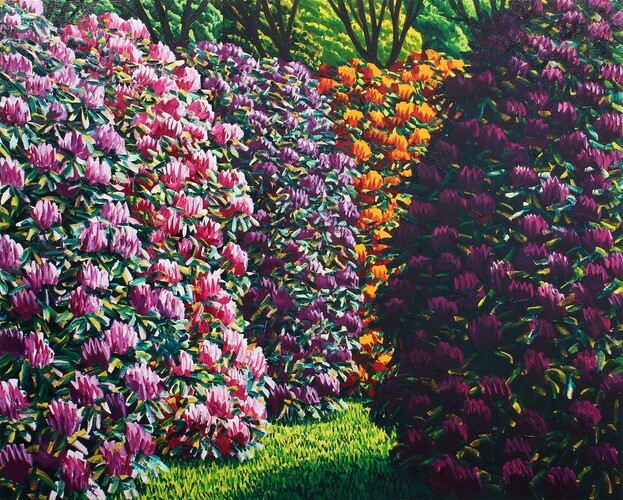 The profusion of flower and foliage in Maughan's canvases is always tightly controlled. Trees and bushes appear impenetrable, a feeling reinforced by the densely layered, confident brushwork of the artist. The juxtaposition of riotous abundance and the deliberate structure sets up visual and psychological tensions - these are gardens of unease. Each compositional element is carefully placed to lead the eye deeper into the picture plane, inviting the question of what lies around the curve of the garden path. The beauty and energy of Karl Maughan's canvases are heightened by the invitation to enter the unknown. In the tradition of the Romantic Sublime, the aesthetic experience is tinged with a frisson of fear - promising a sensory surrender that is both delicious and dangerous.